According to the Youth Suicide Prevention Program, “more than 50% of transgender youth will have had at least one suicide attempt by their 20th birthday.” This data demonstrates a dire need for caregivers, educators and providers to have a better understanding of youths experiencing gender dysphoria (and gender non-conforming youth, who are often mistaken for transgender youth). Presently, our binary society makes the lives of transgender youth more challenging than they need be. Childhood and adolescence mark the start of our gender identity development, our sexual orientation development, and our racial identity development. Those intersections create enough interpersonal and intrapersonal challenges without the added stress of rejection for belonging to a minority group in one or more of those three developmental areas. These transgender youth are growing into transgender adults who own businesses, become politicians, join the military, and become parents. They are a natural and needed part of our society. This book was created to give a voice to these individuals as they are being silenced by some of their caregivers, school officials, religious leaders, and politicians. 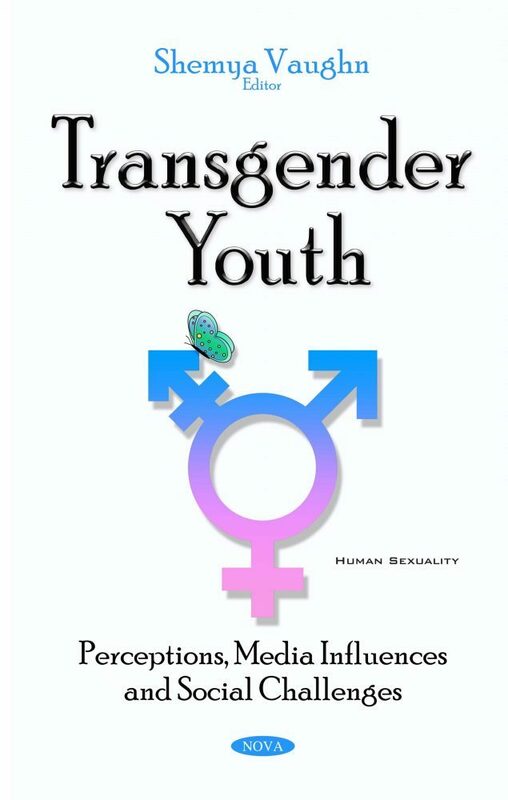 Transgender Youth: Perceptions, Media Influences and Social Challenges is about the experience of child development, adolescent development and gender identity development as well as society’s positive and unnecessary negative responses. Transgender youth have some experiences that their 1950s and 1960s counterparts did not encounter or have access to – hormone blockers, celebrity role models, and social media. This book brings readers closer to empathy for transgender youth and transgender young adults with the ultimate goal of improving the quality of life for these exceptional children and adolescents. The book introduces the topic of gender dysphoria and explains various terms important to this conversation regarding gender identity. It describes the challenges transgender adolescents experience to include barriers and obstacles not faced by their cisgender counterparts. Some parents and their transgender Christian children discuss gender dysphoria, gender identity development, their families’ response to their gender expression, and their experiences within their faith communities. We review the literature on transgender youth and the use of sexual activity as commerce. The audience gets to read narratives of individuals who identify as transgender or transsexual. There are discussions about transgender youth within the foster care system, transgender youth athletes, and the issues they face in school-based and intramural sports programs. Readers are offered suggestions to implement and support transgender youth in their schools and communities. This book is written for school counselors, therapists, psychologists, educators, parents, and transgender adolescents and adults. Others who may find this book useful: transgender advocacy groups, elementary, middle, and high schools, colleges and universities, gay rights organizations, and social service organizations.